Streamlined segmented movement system gives you full control over when you fire Vector movement system with constant acceleration, fuel and orbital mechanics. Accurate power management system gives recharge rates for batteries, and thermodynamic endurance for power generation. Kinetic weapon system that accurately scales damage by the square of the impact velocity, while keeping the map clear of counter-clutter. The Ten Worlds setting grew out of a “great game” played through a Yahoo Group, where players would write (or rewrite) news stories as pertained to events on the governments of their worlds, building forward from that fateful day in February 2214 when ships from Earth stopped returning. Fifty years of history, trade embargoes, alliances and random chaos factors introduced by the moderators resulted in a deeply nuanced setting, where the ten colony worlds of Earth struggled at the abyss of the Long Night and, for now, hold on to the edges, attempting to make economies work...and saddled with fleets of warships leftover from before the Loss. What's the difference between Attack Vector and Squadron Strike? A double-sided flyer showing the four key points of the 3-D movement engine used in AV:T, SITS, and Squadron Strike. It includes a walk-through of a firing solution in 3-D.
One of the questions I get is "Why do you track thrust, rather than simply assume that the displacement on the turn of thrust is equal to the change in velocity, like VMS and Full Thrust?" The download above shows why this simplification isn't really much of a simplification, and why it results in gaping holes in the veracity of the simulation. Eight "origami" style tilt blocks, four each of red and blue, with instructions for assembling them. You can learn how to play using the tutorial from the Attack Vector Tactical 2.0 rulebook. This also includes the table of contents for the complete rulebook and an introduction. Includes the tutorial, bearing tutorial, both sample ships, box miniatures, ship control cards, movement and weapon play aids, and the Range-Angle Lookup Table, all in one convenient PDF. The PDF is zipped to keep the file size down (it's only a little larger than the single tutorial file, but you have to unzip it). Examples of how to shoot bearings, in addition to those in the main tutorial. This is the master ship chart for all ships in the game; it includes the volume and page number, as well as important information for setting up scenarios. This is the index for the entire game, referencing topics by rule number. A spheroid frigate used by the Medinan Star Force with a full class history on the facing page. This is a high-end frigate (arguably the best one in its price range) and is used for demos around the country, along with the Wasp. A cylindrical frigate used by the Olympian Defense Forces Space Arm for fleet fire support, this version has the full class history on the facing page. It's given as a dueling partner to the Rafik class above. This PDF has 5 box minis with the production artwork for the Rafik and Wasp, four "origami" style tilt blocks, and instructions for assembling them. Best printed on card stock, but we've used plenty of plain paper ones. The deluxe version of the Ship Control Cards for Attack Vector: Tactical that come with the second edition. There are two play aids in this file, one blue (with A on top) and one red (with D on top). Print them double-sided, laminate them, and then trim them. If you trim first, and carefully, you can generally put 4 of these sheets in an 11x17 pouch at Kinkos. The front side has all the maneuver information, including a worksheet for the new orbital mechanics rules. The back side has an improved seeking weapon launch work sheet, heat tracking, and damage control tracking. The movement card has the remainder grids for horizontal and vertical vector allocation, as well as the master sequence of play for the entire game. The weapon card has all the weapons in the primary AV:T boxed game, including coilguns, laser tables and nuclear proximity and zone defense weaponry tables. The Shellstar card has 6 shellstars for launching ballistic weapons. We recommend printing many of them, or printing a few and laminating them. 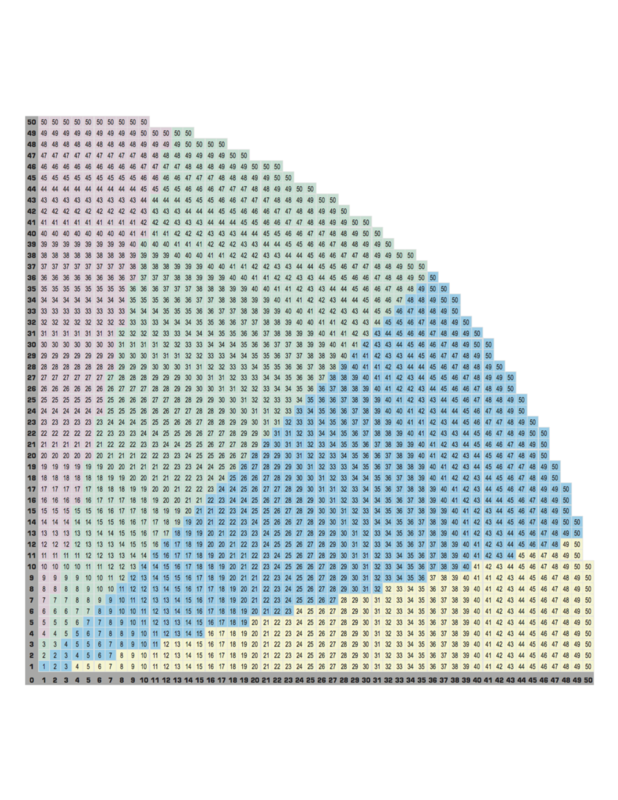 This is a table of the Pythagorean Theorem for calculating ranges along the slant; it's also been color coded to indicate which AVID ring the target is visible through. Completely optional, it's for people who are more comfortable with table lookups than rules-of-thumb.